Iowans can now learn more about the place they call home, through the daily statewide radio feature, Iowa Almanac. Know of a story we should share? Click on the e-mail icon above and let us know! 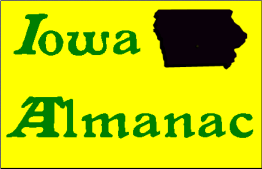 ﻿"Iowa Almanac" is a copyrighted production of Stein Enterprises, L.L.C. No use of the material is allowed without prior written permission of the copyright holder. Copyright 2019, 2018, 2017, 2016, 2015 by Stein Enterprises, L.L.C.